Agrimin 24/7 Smartrace & Smartrace Plus are sustained release bolus' containing copper, iodine, selenium and cobalt. Intended to provide optimum trace element support for breeding cows on grass or forage based diets. Agrimin 24/7 Smartrace is designed for situations where iodine (Plus for selenium and cobalt too) supplementation is essential in the run up to calving. Agrimin 24/7 Smartrace and Smartrace Plus supplies the animal’s full daily requirement of each essential trace element for 180 days. The Agrimin Bolus Applicator A is also available. One 160g bolus should be given to each animal. Use only approved Agrimin bolus guns. Agrimin 24/7 Smartrace boluses are available in packs of 10 boluses. Agrimin 24/7 for Cattle complies with the OF&G Standards and are approved for use in Organic Systems. One 195g bolus should be given to each animal. Always use the approved Agrimin cattle bolus applicator A. Agrimin 24/7 Smartrace Plus boluses are packed in units of 10 (enough for 10 cattle). Agrimin 24/7 Smartrace Plus for Cattle complies with the OF&G Standards and are approved for use in Organic Systems. 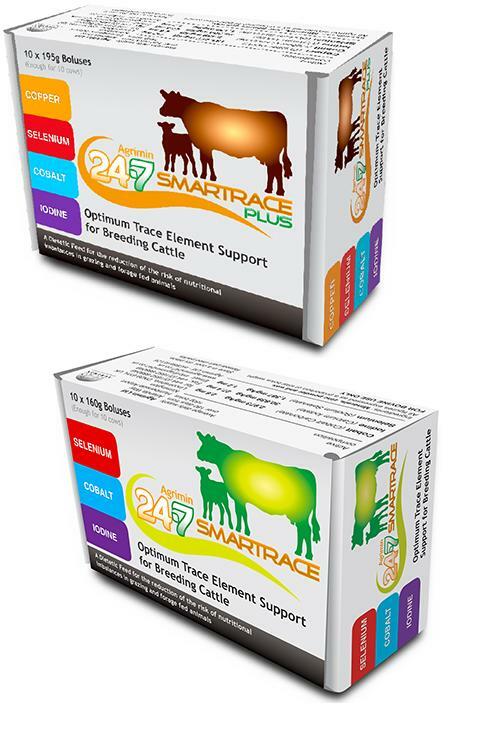 There are currently no questions for Agrimin 24/7 Smartrace & Smartrace Plus Cattle Bolus - be the first to ask one!